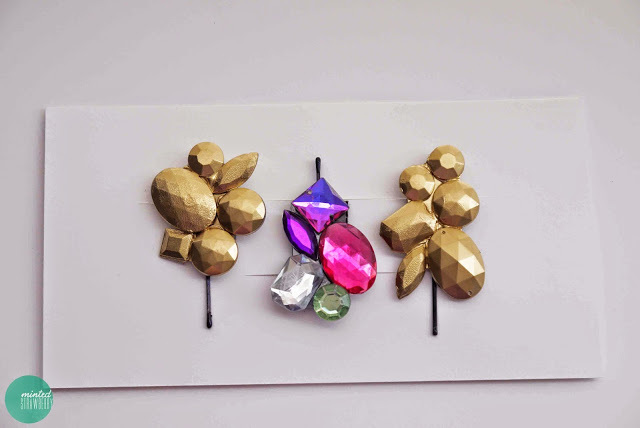 Thanks for these great ideas of using flower cabochons! xxoo. via Cabochon Jewelry with Flower Cabochons. Do you love little flower cabochons known as cabochons with flowery shape? Especially the flower resin cabochons, which are so attractive with their vivid color and the distinctive feature of one completely flat side, so that you can take these cabochons to make beautiful pendants, bracelets, earrings, rings, necklaces, hair clips and decorations to bring your life full of color and flower. If you are jewelry and accessory challenged person, choose flower resin cabochons to whimsical and colorful and brighten any outfits for you. Now enjoy all the cabochon jewelry that I’m sharing below, all the cabochon jewelry shared by our customers are super easy to make beyond of your imagination. Choose your interested cabochons, to create your own cabochon jewelry! Earrings with Flower Cabochons – Take a look at these two pair of earrings, please note they are all mainly made out of flower resin cabochons in white and blue color with basic earring making supplies. 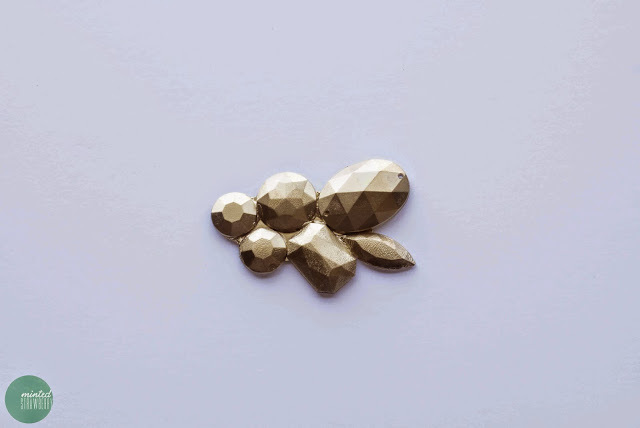 Lightweight and decent size could be the most outstanding feature for earrings’ making. 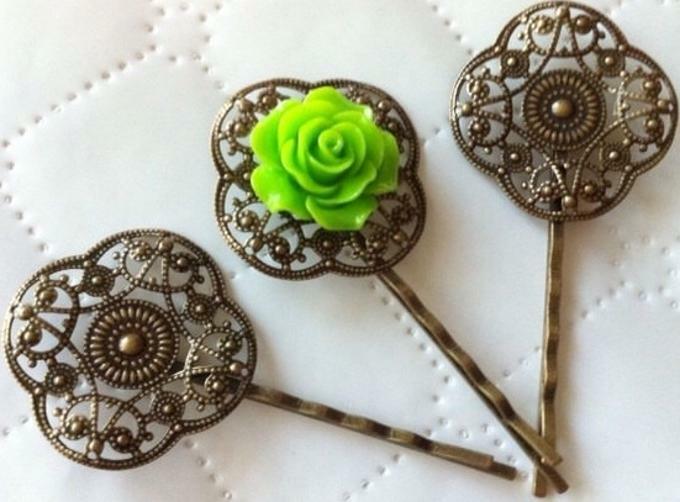 Hair Clips out of Flower Cabochons – How about gluing one flower cabochon to your old hair clip? Sounds amazing, right? 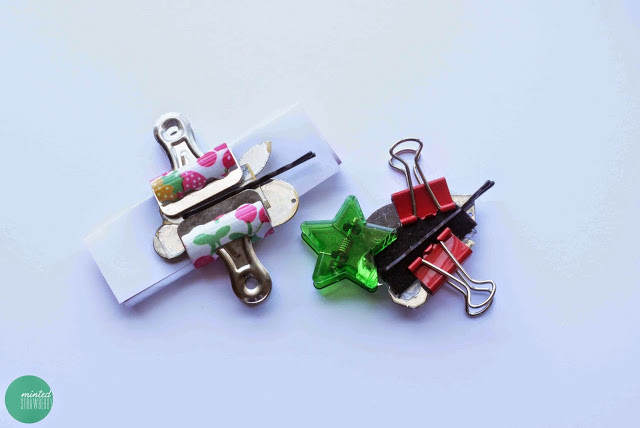 For hair clips making, you only need to select your cabochons and cabochon settings in accordance with your own taste. 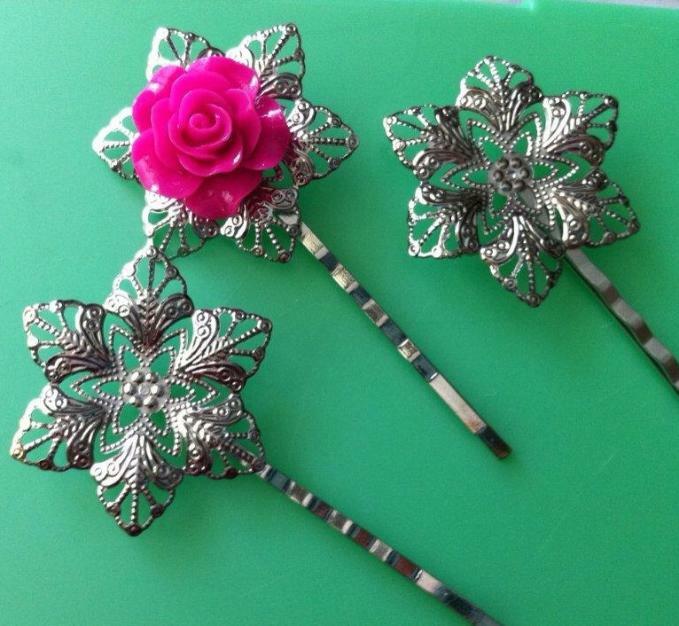 Here are six hair clips designed by our customers. Do you like them? Bracelets with Flower Cabochons – As the pictures show below, to tell me the truth, what kind of stylish and creative bracelets is popping up to your mind when you see these various flowers? 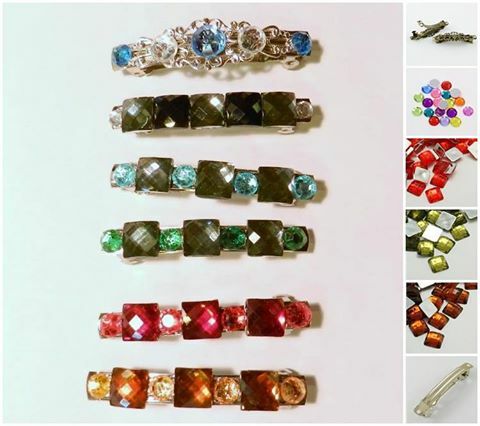 If you want to make similar bracelets, prepare all the jewelry making supplies to make your beautiful cabochon bracelets more attractive and practical in no time. Rings with Flower Cabochons – Cabochon rings come in a beautiful assortment of flower shaped cabochons, beads and ring blank settings to get finished. Incorporating cabochon flower pieces into rings offer a clever hint of vintage flair at a low cost. I love the blue one, how about you? If you have any else prettier designs, commenting below to share with us! 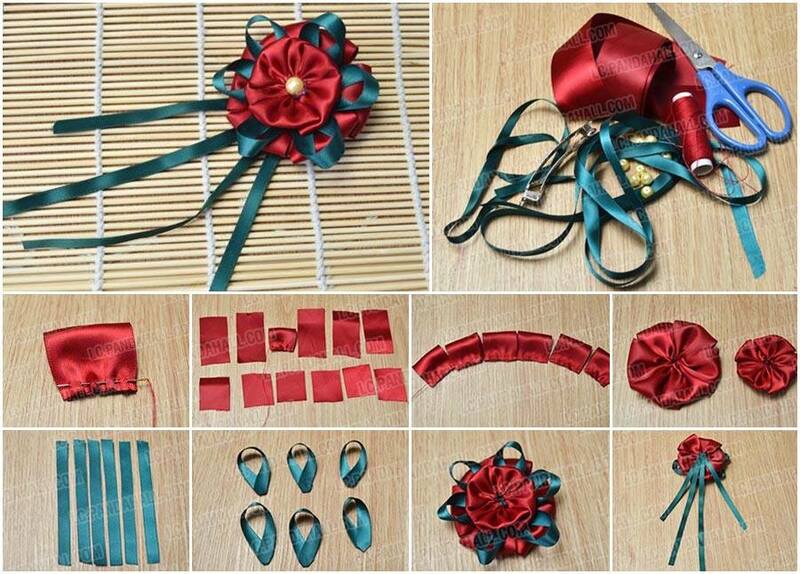 Ribbon Flower Brooch For Christmas! Red and green are the classic Christmas tradition for DIY. So here’s a cute three-layered ribbon flower. 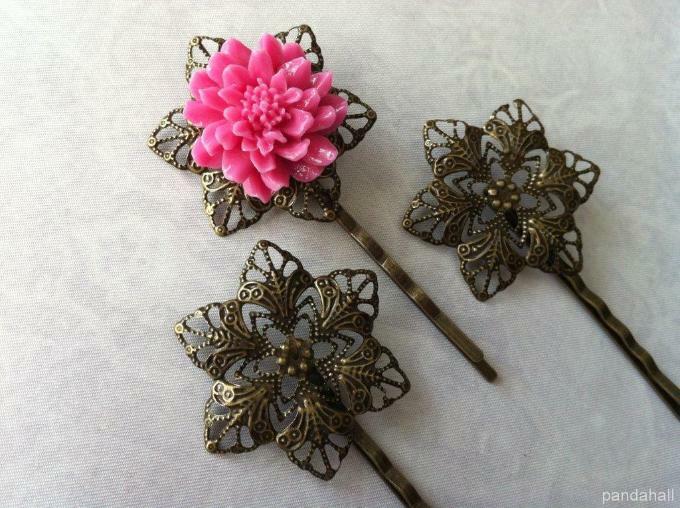 It can be either perfect for brooch or hair accessories. But I’m guess what if I make the ribbon flower smaller and attach it with earring hook? Will it add extra cheers to the coming Christmas? LOL~~There’s still one week left, I’m gonna make a bunch of earrings, hair ornaments, brooches and give out as gifts. Merry Christmas! 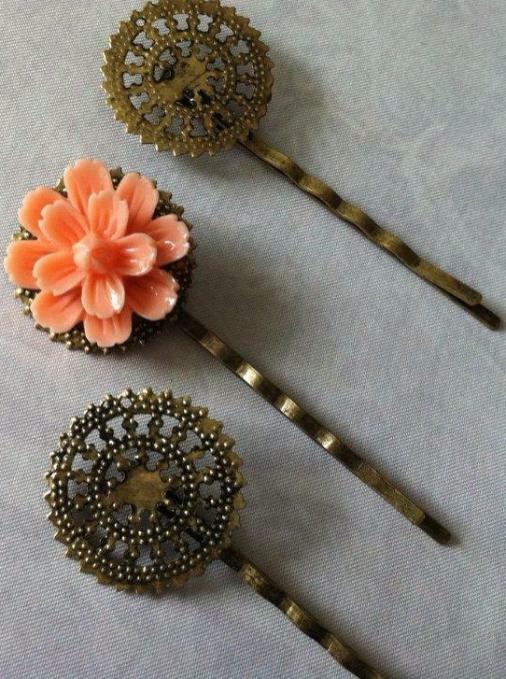 Vintage hair accessories ideas for you! 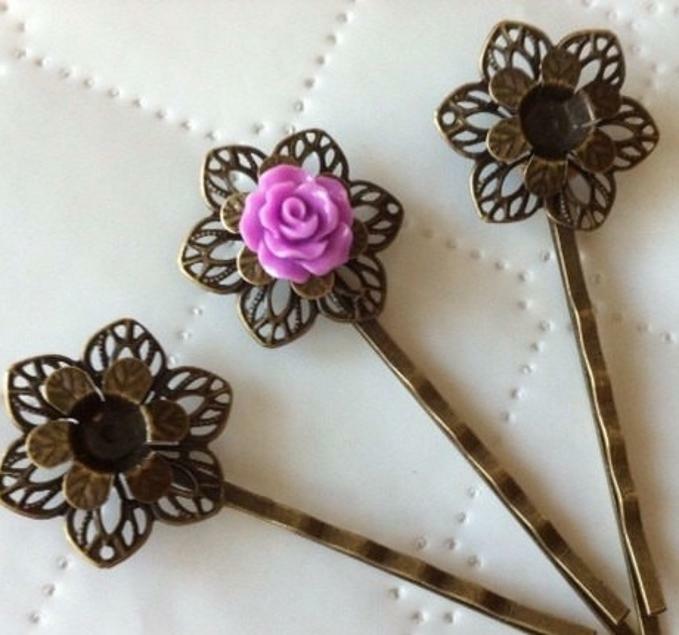 These hair clips are super easy to make and you can spend less than $1 to on each of them. Those sold at stores are much more expensive than these ones! 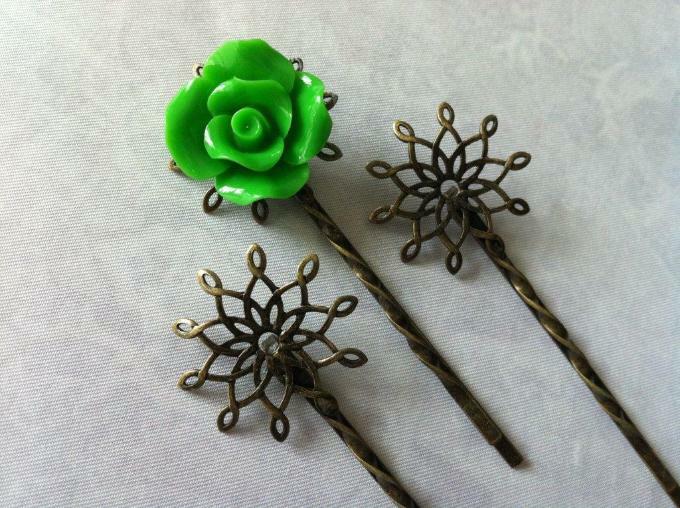 All you need are cabochon flower, hair bobby pin findings and glue! See how beautiful they are, do you love them? Wann have a try yourself? 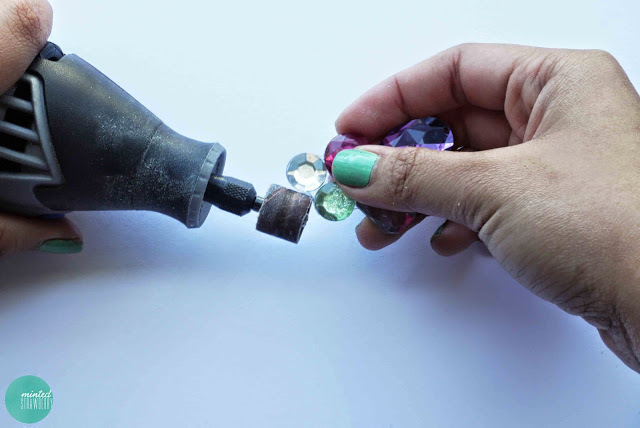 All jewelry hobbyists wish to use new crystals every time they get involved in a project that requires working with gemstones. 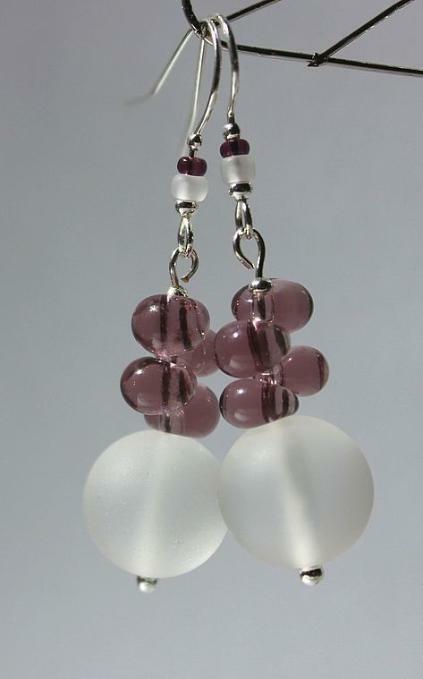 I remember how much excited I was when I got to work with glass beads for the first time. The top quality glass beads that are one of kind can be expensive so it is better that you take care of them while working on a particular project. You can add stones in the safety pins. For some dresses you may need safety pins. These safety pins when visible can make the charm of the dress fall out. You can save the charm of your dress by wearing safety pins willed with beads. 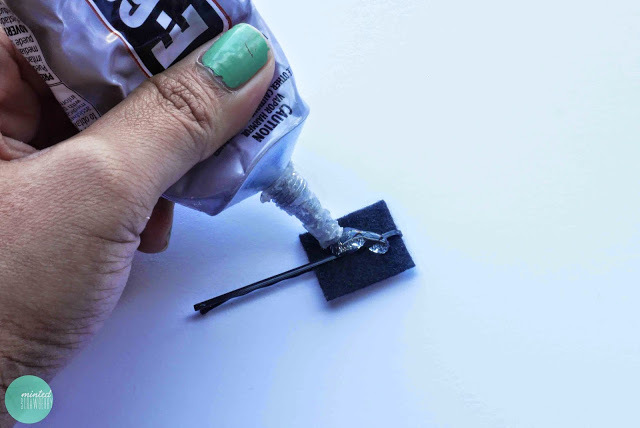 It will look as if you have a small decorative piece on your dress. I used glass beads for making necklaces on cords. These were the necklaces I made for children on my niece birthday party. They were simply giveaways for the children for coming to the birthday bash. I played with different shapes and colors of the beads and created multicolor necklaces for kids. It was a really fun experience. It was quite simple to get started with the necklace making project. 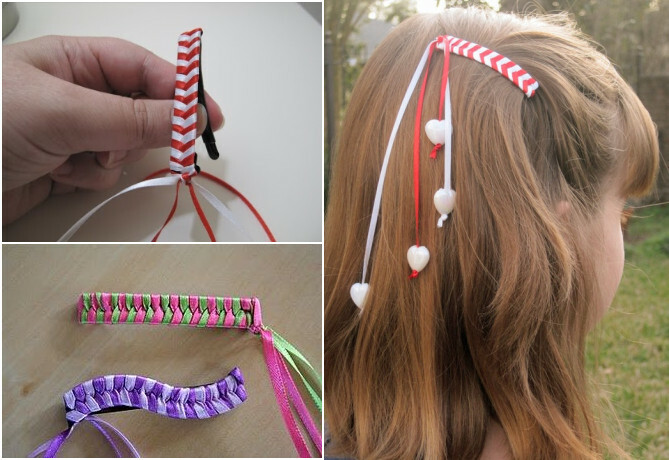 Glass beads can also be tied on to hair for making unique hairstyles. I stole this idea from a fashion magazine where a bride was wearing pearls in her hair. 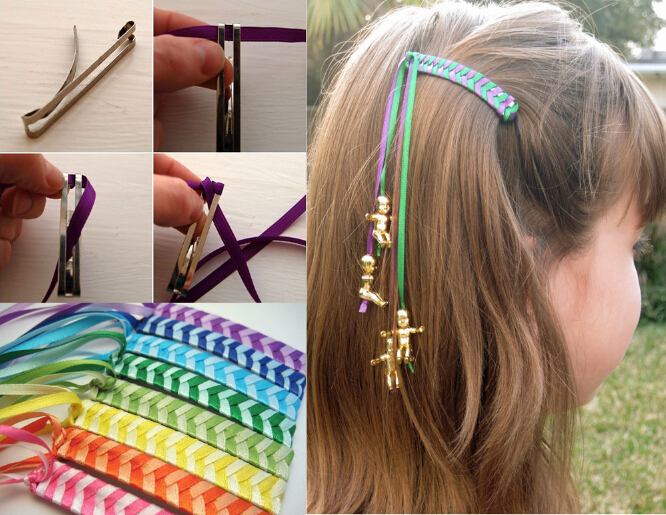 Everybody knows hair accessories don’t come cheap and it’s hard to keep matching accessories for every outfit. I used bobby pins for fixing these beads in my hair and went to the after wedding party of my friend with a unique hairstyle. Everybody just adored the idea. You can even sew the beads onto your clothes for your own stylish line of clothes. You don’t need to sell them, you can keep them for yourself. 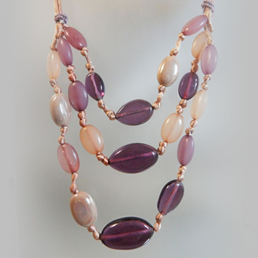 Beads around the hemline and around the neck of the shirt can create a really classy look. Designer clothes with beaded hemlines are also available. Even jackets come with beads. You can adorn your clothes and create your own style by sewing beads onto them. I have designed a shirt with glass beads on for my friend. Just like designing clothes, these beads can also be used for dressing up wallets and purses. It is not necessary to sew them up, they can also be glued. 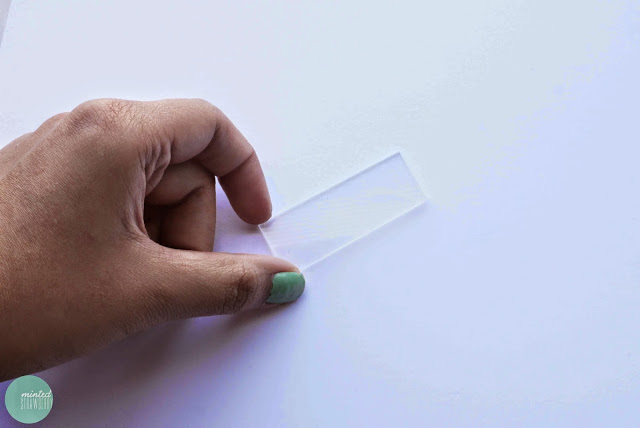 But for that, be sure that you choose the glue that can get transparent when it dries. Don’t choose those beads that have holes as you don’t intend to sew them up. 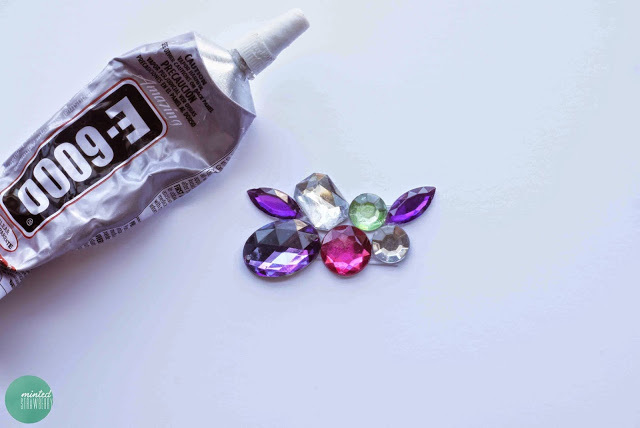 Just make a pattern and glue the stones along. It is going to be a perfect DIY project. While purchasing these beads, it is important that you check the quality. The edges of the beads should be fine. The ones with rough edges can make you get cuts on your fingers. You can keep both expensive and the inexpensive ones to make combination of projects. 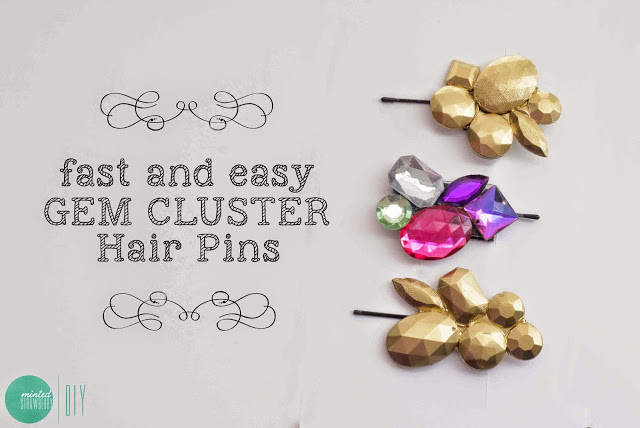 If you wanna make some easy hair clip, try this cluster one made of acrylic beads, that I accidentally saw on online. Easy but pretty! Personally, I prefer the colorful one, as I don’t have much proper clothes for the gold one. See how easy it is to make them now!